Let’s Talk About the Randy Winn Signing, Shall We? Last night, the Knicks led the Raptors by fourteen points at the end of the first quarter, and by five points with 1:28 left. 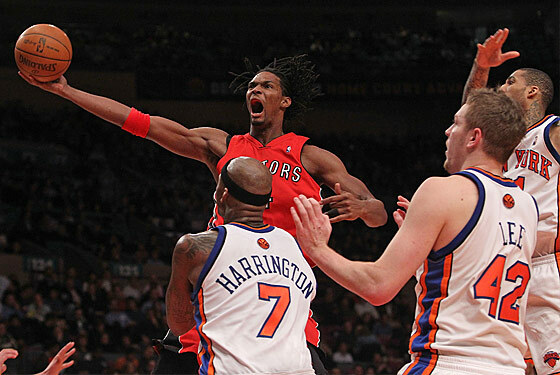 Then everything collapsed: They missed four layups, Toronto hit some big shots, Al Harrington drew a charging call with seconds left, and next thing you know, the Knicks had, somehow, lost. Remember that six-game stretch in which they Knicks needed to go 5–1? They're now 1–1, with games on the road upcoming ... including one against these same Raptors. Sigh. It wasn't just the difficult loss: The Knicks are also going through their first injury spate of the season. Harrington has an issue with his left knee, and Jared Jeffries, whose defense spurred the run in December that got just us everyone so excited in the first place, is having an MRI on his knee this morning and could be out for a while. This also means he cannot be traded, if the Knicks were to punt on this playoff "run" before the February 18 deadline. But why would they do that? They have 6 percent playoff odds and a crushing stretch awaiting them after this supposedly "easier" run against the Eastern Conference. They're hurt, they're losing games they should win, and their main opponents for the final playoff spots are finally kicking into gear. The playoff boomlet is dangerously close to turning into the trading deadline boomlet.